Well, I've found myself repeating letters now. It's hard to keep up with review books and these challenges as well. Hmmm. Very hard! But I did review one book that is a new letter this month, with luck! It was posted on the very last day of July. lol. So, I'm still ticking off letters of the alphabet. I would think I should be done by now, but dang that's a lot of letters to hit! lol. I'm trying! lol. I started off the month great with a YA review, and I'll keep trying. But I was trying to get through some books for authors I saw at Balticon. I did it! 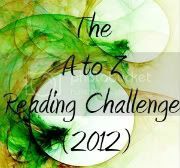 I found something to read with the big scary letter Q! Yeah! Well, I think I might be off to a running start? LOL! I have a few novella's I read in the YA genre, and really enjoyed them. Wow! March is past us already. Where the heck is the year going already? It's flying, and in doing so, making me feel like such a slacker. I still have 15 letters to read. Sounds like it's not so bad being we have 9 months left, but I'm finding a lot of titles have the same beginning letters! I'm hoping to get at least 2 letters down, if not 3 here in April. Um, ah... I'm a slacker at my own challenge! Okay. I did read 2 YA books, but I didn't get the reviews up just yet. I will have them up for March's post though. And maybe a third YA book in the mix too. I'll work harder at doing better.